County ARES Programs Were Prepared: On Sunday night, October 7, Madison County (in the Big Bend of Florida) EC Pat Lightcap, K4NRD, sent this bulletin to his ARES team: "I am calling a special Net for Madison County ARES Monday evening at 7:00 PM. We will use the Lee 145.190 MHz repeater. If it is down we will use 146.550 simplex.The topic will be preparations for potential Hurricane Michael that may come ashore on Wednesday afternoon near Apalachicola and then turn to the northeast toward the Tallahassee/Albany area. Watch the weather and be prepared." More reports to be received will be covered in next month's issue. ARES and Emergency Preparedness -- 2018 ARRL Simulated Emergency Test Continues Through Fall -- Although the main SET weekend this year was October 6 - 7, local and Section-wide exercises may take place throughout the fall. Earthquakes can happen where we work, live, or travel. Great ShakeOut Earthquake Drills are an opportunity for everyone, everywhere, to practice earthquake safety and other aspects of emergency plans. Once again, FEMA is partnering with ShakeOut to encourage everyone to take action and register their participation. The 2018 International ShakeOut day is October 18, when millions of people worldwide will hold earthquake drills in schools, organizations, communities, and households at 10:18 a.m. local time. Visit ShakeOut.org to register your participation, find resources, and learn more. To learn more about earthquake safety, watch the When the Earth Shakes video and visit Ready.gov. "South Carolina ARES was fully activated," ARRL South Carolina Section Emergency Coordinator Billy Irwin, K9OH, reported. Irwin coordinated regularly with the state Emergency Management Division. "We had operators serving 12-hour shifts at the EMD and ultimately moved to 24-hour coverage.Two operators were deployed to Berkeley County to assist with shelter operations at the request of the Emergency Coordinator there." "We literally modified plans on the fly to meet the needs of the mission," Irwin added. "Several ARRL Sections offered assistance." Richland County EC Ronnie Livingston, W4RWL, said volunteers in his county staffed the county EOC and the Red Cross. Operators at the State Emergency Operations Center (SEOC) kept in contact with field volunteers in Marion and Dillon counties after conventional telecommunications failed there. DEC Earl Dean, W4ESD, reported that ARES had deployed operators coordinated with the active agencies. Horry County EC and ARRL South Carolina Section Public Information Officer (PIO) Gordon Mooneyhan, W4EGM, said radio amateurs set up and organized communication networks to assist local government and emergency agencies, as well as to handle health-and-welfare traffic for affected residents, to let their family members outside the affected area know they were all right. A week later, Amateur Radio operators were still dealing with Florence's aftermath: Conventional telecommunications were starting to return to normal in some areas, but others faced record-breaking flooding. "Things are back to normal communication status, and demobilization is occurring for the deployed operators," Irwin said on September 19. The "Driftless Area" of southern Minnesota and Wisconsin is known for its scenic, hilly, beauty as well as a fine network of farm roads. That makes it perfect for great bicycle rides such as Winona, Minnesota's Ride The Ridges. But the same scenic hills and deep valleys also are a communications challenge for members of the Winona Amateur Radio Club (WARC) as they try to provide good communication for the 300 riders and volunteers. 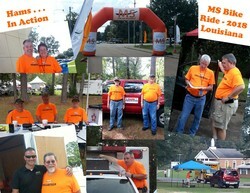 Club members provided communications for the ride, held September 15. Four routes ranging from 23 to 105 miles were patrolled along with seven rest stops. Good voice communication was assured using a UHF repeater near Winona and a VHF repeater 30 miles away near La Crosse, Wisconsin, owned by the Riverland Amateur Radio Club of La Crosse. APRS was used to track SAG and sweep vehicles so the ride director, who had a APRSISCE/32 driven unit in his vehicle, could keep an eye on ride assets. Messaging was also a possibility with APRS. As a public awareness effort, a large-screen display at the ride's start and end showed friends and family the progress of riders. Cell coverage was spotty due to the terrain so the club installed two temporary digipeaters to assure constant contact with the APRS units. can bring technology to these events that the sponsoring organizations don't have other access to. We are there to enhance the event, and to provide a service, not for our benefit but for theirs." There were 15 club members involved in the communications exercise. The ARRL Southern Florida Section hosted a statewide ARES meeting with all three Florida Sections represented, at the Indian River County EOC in Vero Beach on September 1st. With two incoming new Section Managers and two incoming new Section Emergency Coordinators, the section reps all felt that the time was ripe for such a meeting. Operation Equinox was conducted on Sunday, October 1, to test the emergency readiness of HF systems of the ARES organization in the seaside communities of Gloucester and Rockport, north of Boston, Massachusetts. Ron Draper, WA1QZK, reported that the basic plan was to set up portable equipment and practice members' emergency communications response plans on a more individual level, as opposed to ARRL Field Day, which tends to focus on a group effort. Draper noted the opportunity for members to vigorously check out their HF stations in portable, simulated disaster situations. Members set up their HF antennas, found and replaced bad coax jumpers and cables, and tried new antennas. Members also garnered experience with 12 V batteries, and their assets and limitations. "Grab 'n' go" kits both for HF and VHF systems were checked as well as kits for personal needs such as food and water for 2-3 days for self-sufficiency. The Gloucester and Rockport ARES members learned about the needs and protocols of their served agencies. They were advised to have visible ID badges and day packs with the personal items necessary, along with notebooks containing phone numbers of key contacts for local and state officials. Draper recommended the use of tents to limit exposure to the elements. Exercise set up went quickly and efficiently. He commended the group for a "great response for a first time short notice." Author Bascombe J. (Jay) Wilson, W0AIM, is a Certified Emergency Manager (CEM) and has managed critical communications systems for federal and state agencies, local public safety responders and international organizations for major disasters. He has deployed to over 120 disasters as incident commander, operations section chief, EOC watch officer as well as others. He is a member of Colorado ARES. The third edition (2015) of Wilson's book Disaster Emergency Communications - Planning Essentials, Emergency Response Guide and Technical Reference is published by DisasterCom World Press, Longmont, Colorado. The book is well organized and divided into three main parts: Planning Essentials, Emergency Response Guide, and Technical References, with appendices and notes. Wilson leads off by stating that "communication systems essential for public safety have become so complex and so interdependent that when parts of the system begin to fail during a disaster, cascading effects are often catastrophic." He writes that only through "comprehensive systems analysis and extensive contingency planning is it possible to ensure uninterrupted communications during disaster situations." Amateur Radio, of course, is part and parcel of that contingency planning and amateurs become more effective in meeting that goal when they have a working practical and technical knowledge of primary and other backup/supplemental radio services and systems. Wilson's book goes a long way towards meeting that goal. Wilson discusses common challenges facing communicators, and the goals of planning - to devise an infrastructure that meets the requirements of the situation while being as resistant to failure as possible. Planning includes an assessment of primary, backup, auxiliary, and emergency communications systems. Wilson places Amateur Radio in and cites ARES as an auxiliary system, which dovetails with the federal government's labeling of our service sometimes as AUXCOMM or Auxiliary Communications Service. Hazards and threats to critical communications must be identified. Gap analysis - the gap between what you have and what you need - must be identified next. A host of other planning considerations is also discussed. Even with the best pre-planning, the unforeseen can occur, and the next section of Wilson's book - Emergency Response Guide -- provides a rapid guide to essential tasks for fast look-up of information and tips, rather than dense explanation. Initial damage assessment, determining resource needs and prioritizing resource requirements are all discussed. A priority is the drafting of the emergency communications plan; the ICS Form 205 can help. Wilson compares emergency communications systems, and cites the advantages of ARES: Flexibility, no direct cost, voice, data and video modes, high speed multimedia, and local and global coverage. Wilson goes on to discuss all major communications services available to emergency management, with a good discussion of Amateur Radio, ARES, RACES and others. The last part of the book is a comprehensive list of technical references, including standard connectors, a glossary of terms, frequency tables and other reference guides. I recommend this book to all amateur operators involved in public event, emergency and disaster response communications. The book will help you to understand the entire emergency communications environment we work in, not just Amateur Radio. The book is not full of dense jargon, but rather is easy to read, with just the right tone.